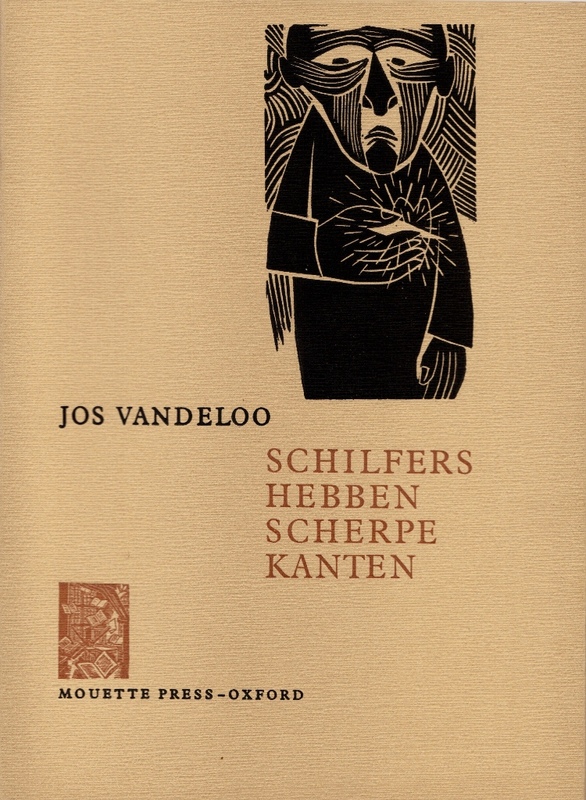 Early 1968 I asked the Flemish author Jos Vandeloo if I could publish his short Text �Schilfers hebben scherpe Kanten� in a bibliophile limited edition with illustrations in my Mouette Press. When I received his permission I set out to find an illustrator and immediately thought of Frans Masereel I wrote to his publisher Mercatorfonds In Antwerp who gave me his address in Nice. I wrote to Masereel in June 1968. I wrote in Dutch since he is originally Flemish, but his reply was in French. He agreed and he initially sent me 2 drawings from which I choose one to be used as the frontispiece . He also allowed me to use one of his other earlier woodcuts as a logo. I used this later occasionally in my catalogues. In July 1968 I received the woodcut block. Meanwhile I had also been corresponding with the graphic artist Paul Peter Piech who in his Taurus Press of Willowdene produced fine limited editions illustrated with his own linocuts. Piech produced 8 additional lino cuts for the illustrations in the text. The private press printer and graphic artist Stanislaw Gliwa agreed to print the booklet which was to come out simultaneously in a Dutch and a German edition. 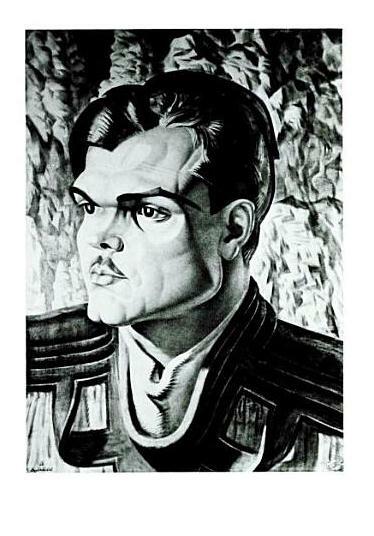 With the 2 orignal drawings / designs by Frans Masereel both signed, one with the dedication �a W.A. Meeuws � and dated 1968. Framed behind glass. Each c. 130 x 170 mm. 7 handwritten letters by Masereel dating between 11 April and 29 July 1968 Dealing with the wood engravings, with 6 of his hand-addressed envelopes and the handwritten address label for the woodblock sent to me in Oxford in 1968. Letter from Hans (Giovanni) Mardersteig of the Stamperia Valdonega in Verona, dated 25 September 1968, asking for more details of my bibliophile publishing plans. I had however already found Gliwa. 1 handwritten and one typed letter and one handwritten card by Stanislaw Gliwa , dating from 1968 and 1972 dealing with the intended booklet. 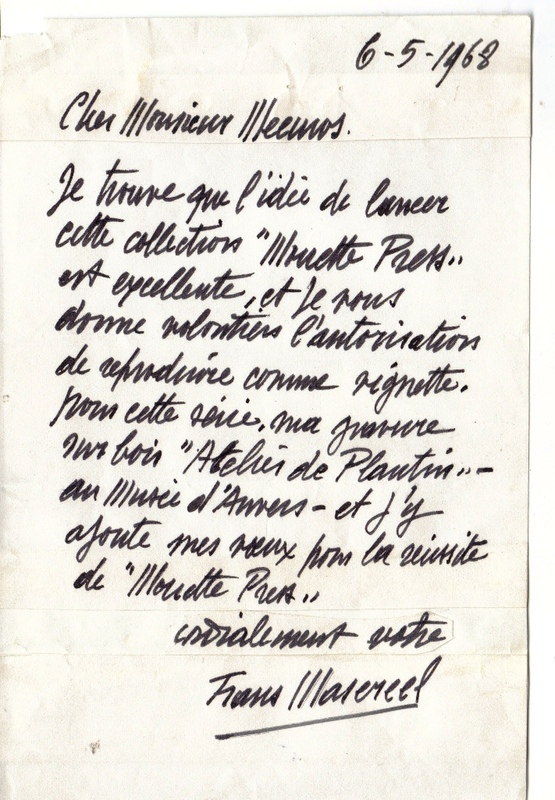 Masereel�s main publisher Pierre Vorms� letter dated 16 October 1972 asking me for full details of the 2 editions so that these may be included in the Masereel bibliography. 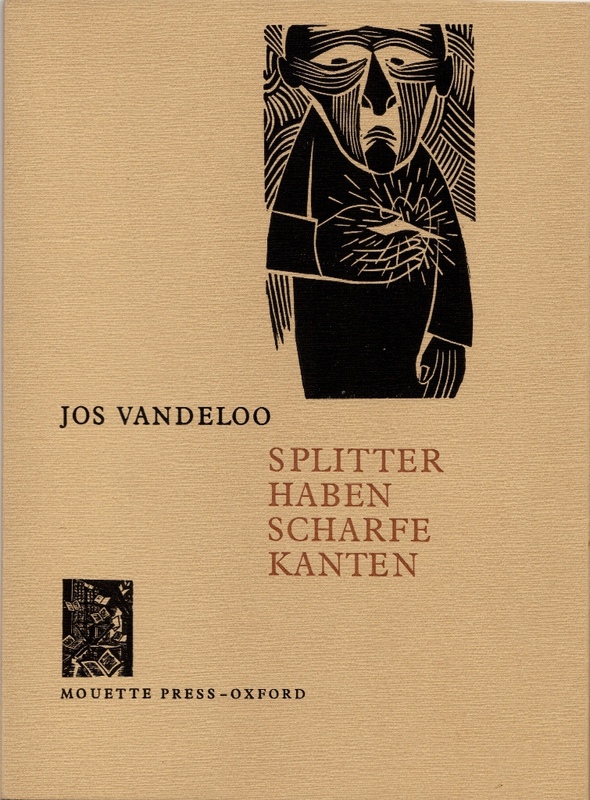 Josephus Albertus "Jos" Vandeloo (Zonhoven, 5 September 1925) a Belgian writer and poet. He grew up in a mining family and graduated as a chemist for the mining industry. After the war he started working in the mine as a coal specialist and for this he travelled throughout Europe (up to 1953). At the same time he also studied Dutch and French literature at the Royal Academy and the Higher Institute for Arts in Antwerp. 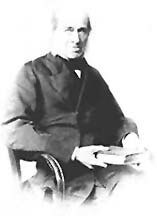 After his career in the mine(as deputy director), he became director of the Belgian division of the publisher Manteau, which published a number of his works. In the sixties he was for a while sports commentator for the Belgian Radio and Television (BRT). Since 1963 he has lived in Mortsel near Antwerp. He made his debut in 1955 with the collection of poems: Speelse parade (E: Playful parade) and became well known with the stories De muur (E: The wall) en Het gevaar (E: The danger). In 1982, he devoted himself full-time to writing. In his work he generally describes the negative impact of modern society, such as loneliness and alienation and he tries to strive for an idealistic environment. He not only wrote novels, stories and poetry but also wrote several screenplays for television and also theatre plays. His work has been translated into several European languages (such as Russian and Romanian) and he has won several awards. Frans Masereel (31 July 1889 � 3 January 1972) was a Flemish painter and graphic artist who worked mainly in France. He is known especially for his woodcuts His greatest work is generally said to be the wordless graphic novel Mon Livre d'Heures (Passionate Journey). He completed over 20 other wordless novels in his career. 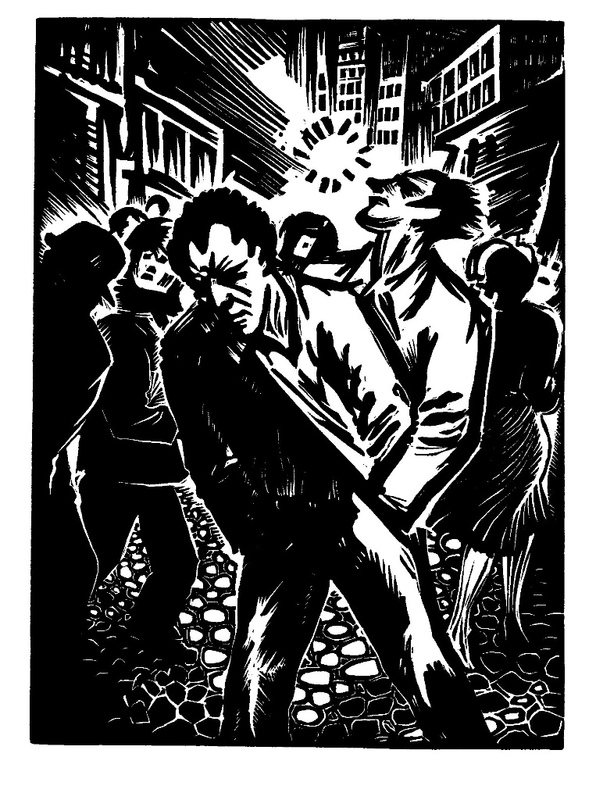 Masereel's woodcuts strongly influenced the work of Lynd Ward and later graphic artists such as Clifford Harper and Eric Drooker. From 1968 Piech worked freelance as a graphic artist but he also taught in numerous art schools including Chelsea, the London College of Printing and Leicester, where he reputedly made the artist Edward Bawden flinch by insisting on referring to him as "Eddy". Piech loved the contact with young people that teaching brought. Never a recluse, he always made time to stop work and talk, whether to supermarket cashiers or the curious passers-by who peered into his "press room". Piech did not crave the perfect studio. He was happy to work in garages. In his series of suburban homes, in Middlesex, Herefordshire and Wales, he would spend evenings cutting his lettering direct on to the lino, whilst keeping one eye on Coronation Street. It was a family joke that Christmas Day ended at 10 in the morning. Once the presents were open Piech went back to his proofs. His fellow printer and writer Kenneth Hardacre once described the urgency of Piech's output as that of "a man whose need to communicate his faith and his fears was so pressing that it often appeared to be impatient with the very means he had chosen for expressing that need". Stanislaw Gliwa (1910 � 1986 ) was born in Krakow, Poland. During World War II he was captured by the Russians and spent years in their prisoner-of-war camps. Eventually he was released with other Poles and reformed into the Second Polish Corps which fought at Montecassino, Italy. It was there that Gliwa's gifts as an artist were noted, especially his drawings of battle scenes and the portraits of his companions. After the War he spent considerable time preparing a history of his unit. Then he went to live in England where he remained the rest of his life. In 1960 he married Maria, a Polish woman who had suffered at Ravensbruck Concentration Camp. They set up a printing press--the Oficyna Stanislawa Gliwy--and over the years produced a series of remarkable small booklets, illustrated with Gliwa's striking linocuts.